When people think of cinema, they tend to think of Hollywood and, generally, America’s output comes to mind. But Britain has made a huge contribution to film over the last 100 years and we can be very proud of that. Let’s explore, shall we? In creating this article, I tried to narrow the list down to 5 key films with 1 representing each genre. Naturally, certain sacrifices had to be made (sorry, romance!) but other films will be touched upon where relevant. Therefore, this isn’t a ‘top 5’ list, but rather a ‘best of’ compilation if you will. Starting with British drama, what better choice is there than Quadrophenia? Adapted from The Who’s seminal album of the same name, Quadrophenia tells the story of Jimmy; a young man struggling through youth in the early 1960s. With a rough home life and dead-end job, Jimmy’s only escape is into ‘mod’ lifestyle. Taking a far more ‘normal’ approach to adapting a Who album for cinema after the downright bizarre but equally brilliant Tommy, Quadrophenia is a very accessible film. There isn’t much by way of plot and therefore doesn’t demand a huge amount of attention. But the film succeeds in its almost time-capsule capture of an era in the history of British youth – it is held very dear in the hearts of the generation of people that the film represents, and is favoured by modern-day mods as one of the best films of all time. Backed by a phenomenal and, naturally, Who-filled soundtrack, Quadrophenia is a classic piece of British cinema. The Wicker Man next, representing British horror on this list. Whilst in recent years we’ve delivered modern classics such as 28 Days Later and The Descent and of course we have a rich history of Hammer horror, there’s nothing quite like this film. Part musical, part dark comedy, part mystery/whodunit…with a whole lot of horror thrown in. To reveal much about the plot would be to spoil it but to those unfamiliar with the story, The Wicker Man is the dark tale of a staunchly religious police officer (Edward Woodward) being dispatched to the island of Summerisle to investigate the disappearance of a young girl. But he’ll soon realise that there is something dark about this little island. Also starring a never-better Christopher Lee, The Wicker Man delivers chills in an unconventional way. Iconic and memorable, no other horror film has ever come close. The Wicker Man also happens to be my favourite film of all time, and is considered by many to be one of the best. Just avoid the American remake at all costs, which funnily enough is considered one of the worst. It’s up for debate whether the film is British or American, but for the good of this list I am going to settle in the British, or at least British-American, camp. The film was made almost entirely in England and care was taken that the film would be sufficiently British to qualify for subsidy from the Eady Levy (box office tax). Despite Kubrick being American, it was co-written with a British writer, edited by a Brit, the cinematographer was British, etc. Representing British science fiction on this list is Stanley Kubrick’s awe-inspiring 2001: A Space Odyssey. The narrative is too complex and, arguably, too abstract to detail here. For those who don’t know it’s probably best to go in blind anyway. But with that in mind, there’s still a lot to talk about here. 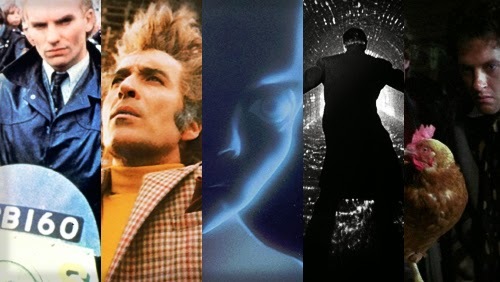 2001 is visually STUNNING, and holds up ridiculously well for a film of its age. I would go far as to say that the visuals of the film look better than a lot of contemporary cinema today. Stick this next to films like Gravity and Interstellar, and you wouldn’t know there’s almost a 50 year gap between them. Even with a filmography that includes The Shining, A Clockwork Orange and Full Metal Jacket, Stanley Kubrick was never better than he was here. The bigger the screen, the bigger the experience with 2001. And I would strongly recommend you pick it up on Blu-ray – the 35mm print is breathtakingly gorgeous. A true classic for you next – Carol Reed’s sublime The Third Man, which I’m using to represent both thriller/mystery and our ‘classic’ output. Orson Welles, of Citizen Kane fame, is on his finest form here – despite not appearing until almost an hour into the film! Joseph Cotton (also in Citizen Kane) plays Holly Martins, a man who unexpectedly finds himself investigating the death of his old friend in post-war Vienna. The narrative, while very strong for a film of its age, is rather inconsequential. It’s the style that excels this film into classic status. Filled with film noir iconography, a fantastic zither score, and some of the most hauntingly beautiful cinematography you’ll ever find, The Third Man has earned its place as one of the greatest films of all time. This is golden age cinema and feels like classic Hollywood, but is a truly British production. Influential, stylish and ahead of its time, it would be rude not to include The Third Man on this list. Comedy was a tricky genre to choose. With Monty Python’s better films (Life of Brian & The Holy Grail) and modern classics such as Sightseers and Shaun of the Dead, it was a close call. But at the end of the day, you simply cannot beat Withnail & I. Bruce Robinson’s semi-autobiographical tale of 2 out-of-work actors taking a rather disastrous holiday in the countryside is a certified comedy classic. With a huge number of loyal fans to this day, the film has been described as “one of Britain’s biggest cult films”. Endlessly quotable, the film launched the career of Richard E. Grant who is phenomenal in the role of alcoholic Withnail. The film also rocks a great soundtrack, featuring Hendrix songs and a rare appearance of a studio Beatles song – licensed for the production only because George Harrison was a producer. Also starring Paul McGann as the eponymous ‘I’ and the late Richard Griffiths as the camp and flirtatious Uncle Monty, Withnail & I is a wonderfully British 2 hours of hilarity. In conclusion, Britain has put out a huge amount of phenomenal cinema over the years and this article only dips its toe into the ocean of great films the people of Britain have created, and in some cases, helped create. With recent British successes like The Imitation Game, Paddington and The Theory Of Everything, British cinema is not slowing down.